The Questions that Matter the most to European citizens center on the existential threats of terrorism, immigration, and climate change. This is followed by economic anxiety across several indicators of national economic performance and individuals’ economic security. 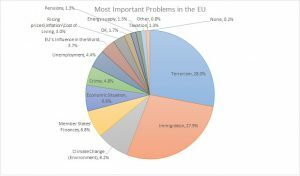 According to the Eurobarometer 88.3 [November 2017: ZA 6928/ICPSR], the issues that EU citizens rank as the two Most Important Problems facing the EU community include – in descending order of importance – Terrorism (28%) and Immigration (28%), with Climate Change a distant third (8.2%). This is followed up by Member States’ Finances (6.8%), Economic Situation (6.6%), Crime (4.8%), and Unemployment (4.4%). At the country-level, however, their concerns turn decidedly inward. Unemployment (14.7%), Health and Social Security (13.0%), Rising prices/inflation/cost of living (11.5%), and Economic Situation (9.7%) outrank Immigration (9.0%) and Terrorism (4.5%). Unemployment is the number one concern in France, Italy, Greece, Spain, Portugal, and Croatia and comes in the top 3 Most Important Problems in Belgium, Austria, Cyprus, Lithuania, Slovakia, and Slovenia. This is the single most common response. 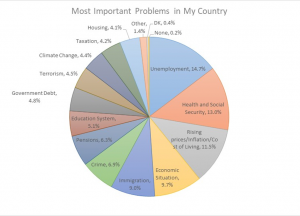 Immigration is second, coming in at the top of the list of concerns in Belgium, Denmark, Germany, and Austria. Immigration is also mentioned in the top 3 in France, the Netherlands, Italy, Sweden, Great Britain, Hungary, and Malta. Climate Change and the Environment are mentioned in the top 3 in only 3 countries: Malta, the Netherlands, and Sweden. Other than Unemployment, some mention of daily economic issues including Health & Social Security; Rising Prices/Inflation/Cost of Living; and the generic Economic Situation featured in every country except Malta. This was particularly pronounced in the newer EU members states in the East. Why is unemployment so devastating to individuals and societies? How does being unemployed affect individuals’ choices and behaviors? In addition to present circumstances, does being unemployed affect future expectations and life prospects? What are the greatest challenges to the next generation of Europeans? What cross-currents of the market and democracy identify current and future challenges? How can we promote positive individual outcomes and opportunities as well as identify hindrances and facilitators? Is inequality a necessary element of economic growth? If so, can we live well without growth? How do changes in national-level income inequality affect the quality and extent of life chances for citizens? Not all inequalities are the same. Which best identify functioning – and non-functioning – political and economic institutions? Is economic growth necessary for countries to flourish? Can democracy be a counter-balance to market-generated inequalities? What is inequality’s influence on democratic politics including popular uses and perceptions of democratic institutions? How do citizens’ perceptions of how democracy and the market work influence their orientations, attitudes, and behaviors? How do the ‘real’ context of modern nation-states compare to individuals’ experiences and perceptions of them? What explains their alignment or divergence? How do individuals’ expectations of future market and democratic performance shape their support for these institutions?